Well thanks for the previous article on Hyper-convergence. we talked about the Cisco Hyper-Flex in earlier article. We will have many competitors in the market for the Hyper-Converged networks. I knew some of you are still in confusion that what Hyper-Convergence actual means and where it is actually using the real environment but some of you guys are already working on the Hyper-Converged networks from the various vendors in the market. Meanwhile i will start discussing about the Hyper-Converged network, I want you guys to just go through the previous article which i wrote on the Hyper-Flex ( Cisco Hyper-Converged Network Infrastructure ). In this article i am just taking the examples and the information about the other vendors majorly Nutanix on the Hyper-Converged Infrastructure. I knew there are other Vendors who are strong stories around it but i am touching Nutanix because it is one of the most successful stories in the Hyper-Converged Space to define. Hyper-Convergence is a Software centric infrastructure architecture which integrates the features of compute, storage, networking and virtualization for the resources in the enterprise network. So what this Hyper-Convergence did ? Well all the features like Server, storage, compute and that is software defined in the single box on the X86 rack servers makes the complete HCI (Hyper-Convergence) in one box. Before you are going to study about the hyper-convergence you should have the knowledge of the datacenter environment of Servers, Compute and storage. Today i am not talk about the Cisco but we will compare the other models and the vendors in the market for these and moreover i will touch on the Nutanix Hyper-Converged models which are one of the leaders in the Hyper-Converged market. In early 2000s, entire ecosystems of server and storage infrastructure, software, applications, and tools were built around proprietary platforms.I knew that model is successful model but the Industry is moving very fast and always there is so many changes takes place after 2000. 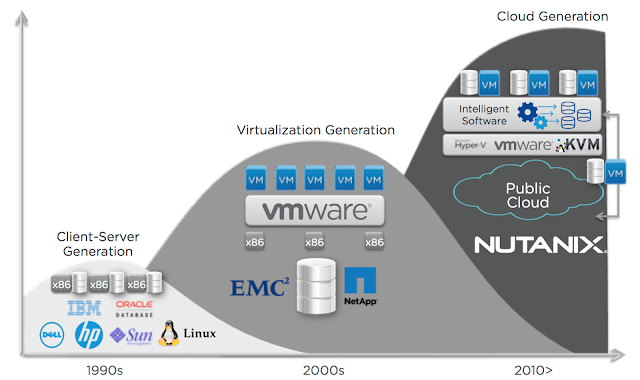 The late 2000s saw the rise of server virtualization. I guess many of you know about the Server virtualization concept. This created a fundamental shift in the datacenter landscape. Compute infrastructure went from scale-up to a modest scale-out architecture, and the underlying hardware got abstracted from the layers above using the hypervisor, eliminating platform lock-in and allowing on-demand scaling. Companies like Google and Facebook started pushing the limits of existing infrastructure systems and processes in ways that traditional businesses did not. In response to traditional infrastructure’s inability to meet their needs, they developed a unique approach to datacenter infrastructure that leveraged software as the mode for deploying functionality, including data and storage management and control. 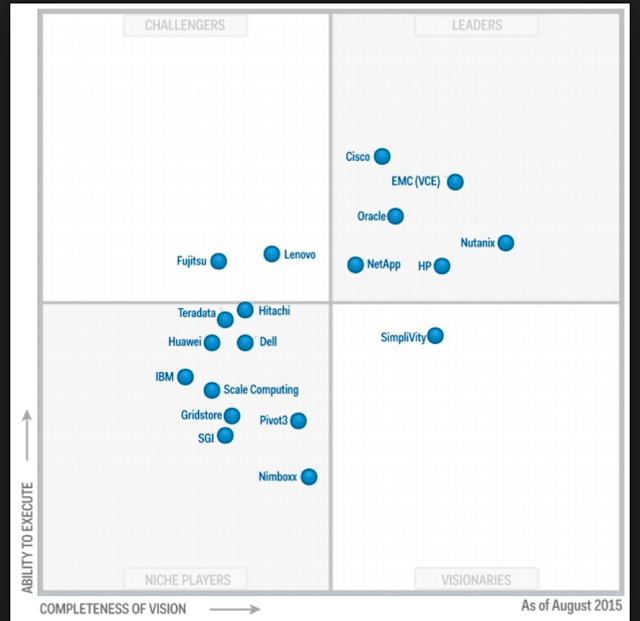 Lets compare all the vendors now in the Hyper-Converged space in the market. These below stats are basically from the Huawei Hyper-Converged Story. I will check the real stats if it is wrong any way and will share with you. There are other vendors as well in the market who are successful get some part of the Hyper-Converged Market but we just took the major ones here, Cisco comes late in the Hyper-Converged Market but with the Hyper-Flex various 3 models they are come up with the strong Hyper-Converged Infrastructure. So let's talk about Nutanix, one of the Biggest player in the Hyper-Converged network and also be the leaders in the Gartner Magic Quadrant in his space. Nutanix XCP which Nutanix called as Hyper-Converged and is a software-defined infrastructure that combines web-scale engineering with a consumer- grade user experience. XCP is hyper-converged infrastructure that natively converges compute, storage, and virtualization into a single solution. It is built using industry-standard platforms with Intel processors, locally attached flash, and hard disk drives. Nutanix XCP can also leverage all flash systems for cases requiring predictable low latency across the entire dataset. Nutanix XCP leverages Nutanix Acropolis and Prism, creating invisible infrastructure that eliminates infrastructure complexity for a simpler, more uniform environment. IT teams focus on managing enterprise applications, not wrestling with infrastructure. 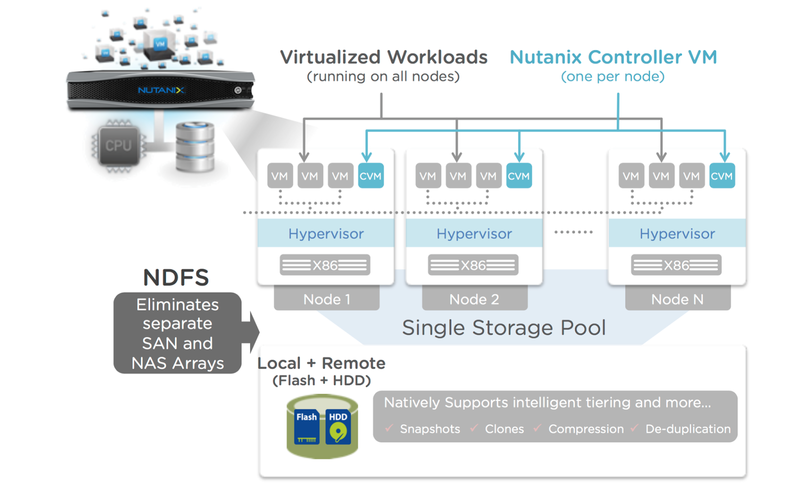 The Nutanix solution is designed in such a way that all data, metadata, and operations are distributed across the entire cluster using the Nutanix Distributed File System (NDFS). With no bottlenecks in the data or control path, the environment can grow without limits and resources across the entire cluster can be used for storage functionality. Additionally, NDFS automatically tiers data across a cluster’s local and remote SSDs and HDDs. Nutanix is 100% software-defined. All of the intelligence is in the software layer, and the system does not rely on special-purpose hardware for resilience, performance acceleration, or core functions. This allows new capabilities, such as deduplication of the capacity tier, to be quickly added without requiring hardware upgrades or even planned downtime. Infrastructure can be configured on-the-fly without requiring rewiring or additional hardware purchases. Cisco, EMC, Nutanix, Oracle, HP and NetApp is the leaders quadrant in this space but yes Lenovo and Fujitsu is competing fast with these players. Even Simplivity is also one of the emerging player in this domain and capture a huge market space. I will come up with the architectural discussion and also share some of the common use cases for this infrastructure to discuss further on this. I knew its hard to understand in the first readings but i am sure soon you guys will understand the emerging technology and the uses around your network space soon. The simplest way to understand the basic and the detail understanding of this product portfolio is to understand the use cases around the datacenter study guides and the how these are implementing in the design or implementation phase. We will come up soon about the further discussion on the Hyper-Convergence. Please let me know if you have any queries around this article to understand further else wait for our next article on the hyper-Converged topic to make you a deep dive into the hyper-Converged networks.